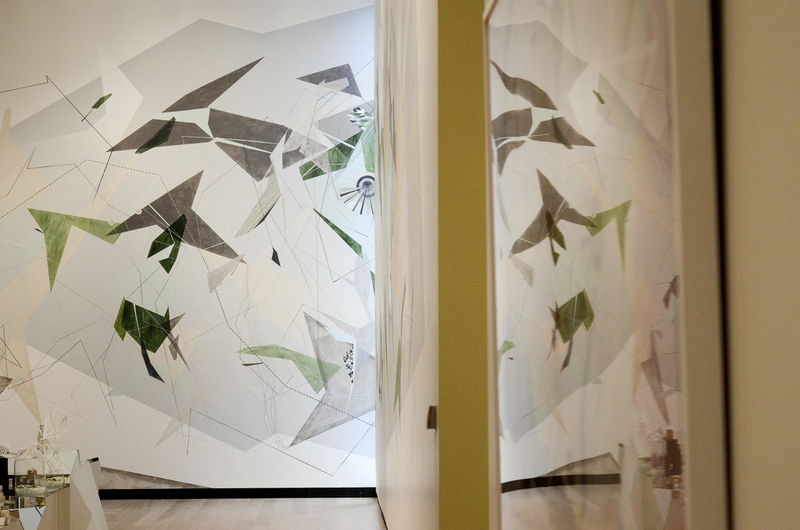 At over eighty-feet-long, Tegeder’s wall drawing at the Wellin Museum—titled Ondam: Hollow Green Gray Velocity Transmitter with Tunnel Routes and Stations with Pipe Chrysalis Headquarters City Plan with Safety Routes in Snow Green with Developments Contraption and Triangle Headquarters with Complete Love Algorithm and Magnetic Diagram for Beauty with Methods and Analysis with Tower Manifesto and Ecstatic White Metallic Mine Tunnels and Pantone Structure with Yellow Categories with Luminous Connectors and Lemon Elevator Structures—is the largest to date, and results from studying the architectural blueprints, specifically the pipes, electrical conduits, beams, and invisible design components of the Museum’s new Machado and Silvetti-designed building. When Tegeder was first invited to show at the Wellin, she immediately came for a hardhat site visit in the summer of 2012, while the facility was still under construction, so she could record and observe the structure as it took shape. Tegeder particularly responded to the Exhibition Gallery’s windows—thin twenty- five-inch-wide apertures spanning the full height of the gallery’s eighteen-foot walls—and made them a central point for the new drawing. She visited the space at different times of day to study the quality of light and incorporated her observations into the design of the drawing. This type of objective research and synthesizing of information pervades Tegeder’s work and crosses into the various mediums she employs. 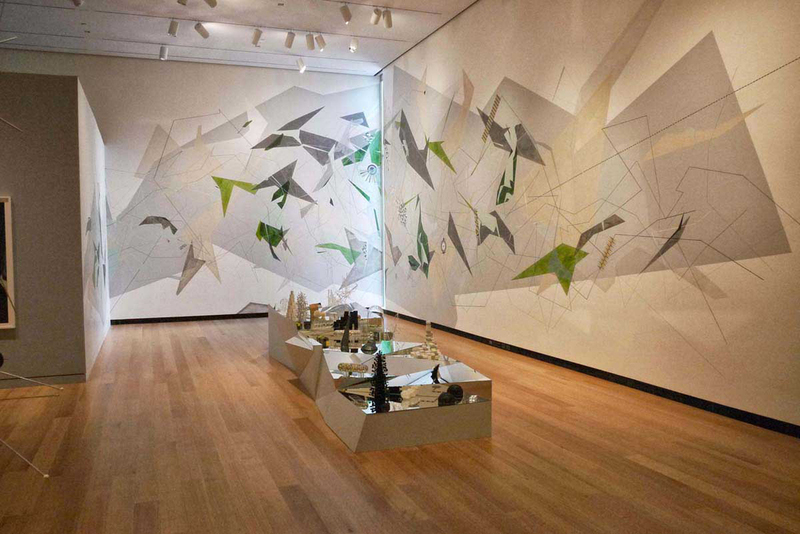 In a significant way, wall drawing as a process was a long- sought fulfillment for an artist who has utilized architectural forms throughout her career. In Tegeder’s paintings and drawings from 1996 to 2003, the highly structured organization of her imagined cityscapes is defined with a clear horizon line that is firmly rooted in architectural design and urban planning. The forms that she developed within her earlier compositions still persist today. These continuously evolving shapes are assigned particular meanings and functions in what the artist describes as “safe cities”—plans for futuristic, underground metropolises that are yet-to-be inhabited, and that intimate a utopian, end-of-the world eventuality for civilization.